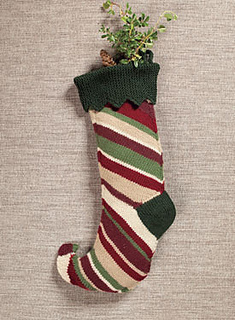 Deck the halls with these fun and festive stockings! 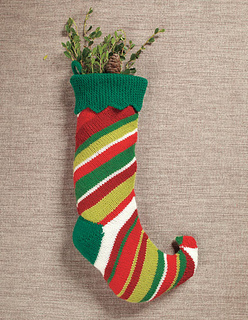 These Elf Stockings are sure to usher in the holiday season with a touch of whimsy. Worked from the top down, the stockings feature jovial stripes that are knit on the bias and a series of short rows are used to create the elf-inspired curled toe. The cuff is picked up from the top of the stocking and knit perpendicularly to create a fun pointed edging. Knit in Wool of the Andes Worsted, these stockings will work up quickly while being durable enough to enjoy and display year after year. Choose between the classic holiday bright or soft, retro-inspired palette to decorate your home for the holidays. Measuring 16” deep, these generously sized Elf Stockings are wonderful as home decor or as a special gift for family and friends.